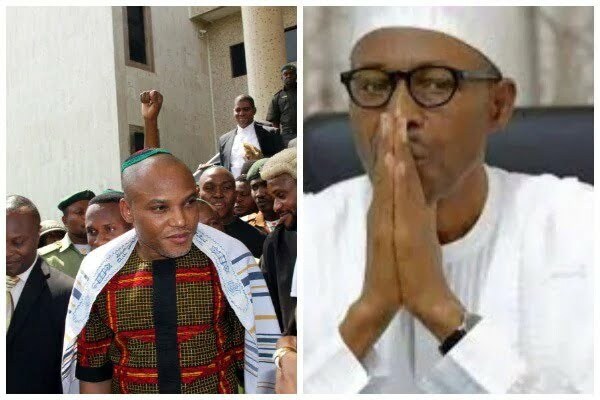 Leader of the Indigenous People of Biafra, IPOB, Mazi Nnamdi Kanu has claimed that a stage play artiste from Sudan, Jubril Aminu Al-Sudani, is still at the Aso Villa impersonating a â€˜deadâ€™ President Muhammadu Buhari because Nigerians have not staged mass protests to demand for proof of his true identity. His words: â€œJubril is in Aso Rock. The reason he is still there is because we have not come for him. In any reasonable country around the world, the citizens should by now commence a worldwide protest to demand the identity of their president. â€œWhy is this Sudanese impostor in Aso Rock? Abba Kyari is nowhere to be found (for explanations). They said he went for medical treatment. â€œLetâ€™s ask Femi Adesina a simple question: â€˜Presidency show us a video of Buhari in Paris.â€™ Perhaps, they may have a case (if he did) but there is none because Jubril wasnâ€™t there. There was no Buhari in Paris. â€œThere was once a rumour that Obasanjo was dead but he came out and said â€˜I dey kampe.â€™ Jubril canâ€™t do that because he is not Buhari. Nigeria must fall. It is going to collapse under the weight of this fraud and deception of Jubril. He continued: â€œThis evil agenda of Jubril was premised on the desire of the Northern to hold onto power at all cost. They know it. Atiku knows it. While Kanu did not speak on the presidentâ€™s fingerprints, he explained that pre-2017 photographs of President Muhammadu Buhariâ€™s left side outer ear had a deformed lobule and a straight antihelix, adding those unique features can no longer be found in the Presidentâ€™s recent photographs.